By the death of his father, the care of him devolved upon an uncle, Samuel Prior, who kept the Rummer tavern, near Charing-cross, and who discharged the trust | Imposed in him with a tenderness truly paternal, and at a proper a<re sent him to Westminster school, where he was admitted a scholar in 1681, and distinguished himself to great advantage. After remaining here for a short time, he was taken home by his uncle, in order to be bred to his trade. At leisure hours, however, he pursued the study of the classics, on which account he was soon noticed by the polite company who resorted to his uncle’s house. 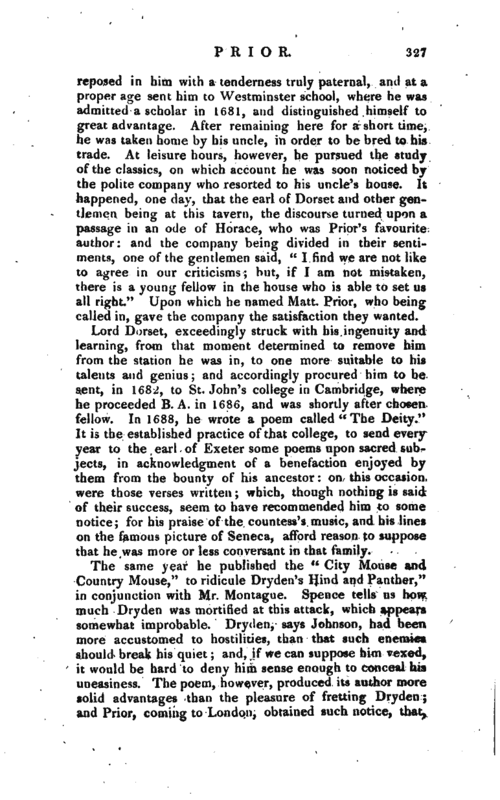 It happened, one day, that the earl of Dorset and other gentlemen being at this tavern, the discourse turned upon a passage in an ode of Horace, who was Prior’s favourite author: and the company being divided in their sentiments, one of the gentlemen said, “I find we are not like to agree in our criticisms; but, if I am not mistaken, there is a young fellow in the house who is able to set us all right.” Upon which he named Matt. Prior, who being called in, gave the company the satisfaction they wanted. Lord Dorset, exceedingly struck with his ingenuity and learning, from that moment determined to remove him“from the station he was in, to one more suitable to his talents and genius and accordingly procured him to be sent, in 1682, to St. John’s coiiege in Cambridge, where he proceeded B. A. in 1686, and was shortly after chosen fellow. In 1688, he wrote a poem called” The Deity." It is the established practice of that college, to send every year to the earl of Exeter some poems upon sacred subjects, in acknowledgment of a benefaction enjoyed by them from the bounty of his ancestor: on this occasion were those verses written; which, though nothing is said of their success, seem to have recommended him to some notice; for his praise of the countess’s music, and his lines on the famous picture of Seneca, afford reason to suppose that he was more or less conversant in that family. The same year he published the “City Mouse and Country Mouse,” to ridicule Dryden’s Hind and Panther," in conjunction with Mr. Montague. Spence tells us how. much Dryden was mortified at this attack, which appears somewhat improbable. Dryderr, says Johnson, had been more accustomed to hostilities, than that such enemies should break his quiet and, if we can suppose him vexed, it would be hard to deny him sense enough to conceal his uneasiness. The poem, however, produced its author more solid advantages than the pleasure of fretting Dryden and Prior, coming to London, obtained such notice, that, | in 1691, he was sent to the congress at the Hague, as secretary to the embassy. 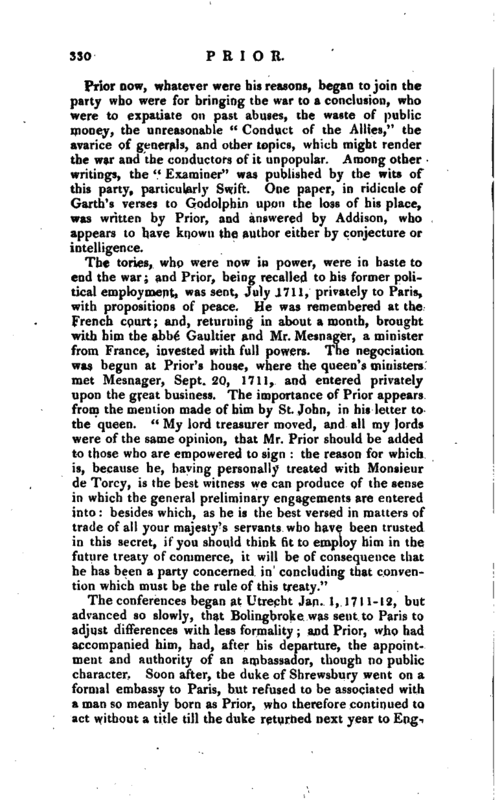 Prior had been the enemy of Dryden some years before the revolution, and had the hardihood to represent that great writer as a miserable poetaster, in an anonymous satire on which, probably, says Malone, he did not reflect with much satisfaction, when he became a tory. Prior, however, never published any satire but this, and one on “The modern Poets,” which he wrote in 1687 or 1688. From his “Heads of a Treatise upon Learning,” a manuscript formerly in the possession of the duchess dowager of Portland, it appears, that he abstained from this dangerous exercise of his talents, on prudential considerations. In this same ms. he thus speaks of himself: “As to my own part, I felt this (poetical) impulse very soon, and shall continue to feel it as long as I can think. I remember nothing farther in life, than that I made verses. I chose Guy of Warwick for my first hero and killed Colborn, the giant, before I was big enough for Westminster. But I had two accidents in youth which hindered me from being quite possessed with the muse. I was bred in a college where prose was more in fashion than verse and as soon as I had taken my first degree, was sent the king’s secretary to the Hague. There I had enough to do in studying my French and Dutch, and altering my Terentian and original style into that of articles and conventions. So that poetry, which by the bent of my mind might have become the business of my life, was, by the happiness of my education, only the amusement of it; and in this, too, from the prospect of some little fortune to be made, and friendship to be cultivated with the great men, I did not launch much into satire; which, however agreeable at present to the writers or encouragers of it, does in time do neither of them good: considering the uncertainty of fortune, and the various changes of ministry, and that every man, as he resents, may punish in his turn of greatness; and that in England a man is less safe as to politics, than he is in a bark upon the coast, in regard to the change of the wind, and the danger of shipwreck.” By these prudential maxims, Prior appears to have been guided through the greater part of his life. His conduct at the Hague was so pleasing to king William, that he made him one of his gentlemen of the bedchamber; and he is supposed to have passed some of the | next years in the quiet cultivation of literature and poetry. In 1695 he wrote a long ode on the death of queen Mary, which was presented to the king; and, in 1697, was again employed on public business, being appointed secretary to another embassy at the treaty of Ryswick, and received a present of 200 guineas for bringing that treaty over. In the following year he held the same office at the court of France, where he was considered with great distinction. We are told, that as he was one day surveying the apartments at Versailles, being shewn the victories of Louis, painted by Le Brun, and asked whether the king of England’s palace had any such decorations “The monuments of my master’s actions,” said he, “are to be seen every where but in his own house.” The pictures of Le Brun are not only in themselves sufficiently ostentatious, but were explained by inscriptions so arrogant, that Boileau and Racine thought it necessary to make them more simple. He was in the following year at Loo with the king; from whom, after a long audience, he carried orders to England, and upon his arrival became under-seeretary of state in the earl of Jersey’s office; a post which he did not retain long, because Jersey was removed; but he was soon made commissioner of trade. In 1700, at which time he was created M.A. he produced one of his longest and most splendid compositions, the “Carmen Seculare,” in which he exhausts all his powers in celebrating the glories of king William’s reign, and it is supposed with great sincerity. In the parliament which met in 1701, he was chosen representative for East Grinstead, and now voted for the impeachment of those lords who had persuaded the king to the partition -treaty, a treaty in which he had himself been officially employed, but which it is thought he never approved. 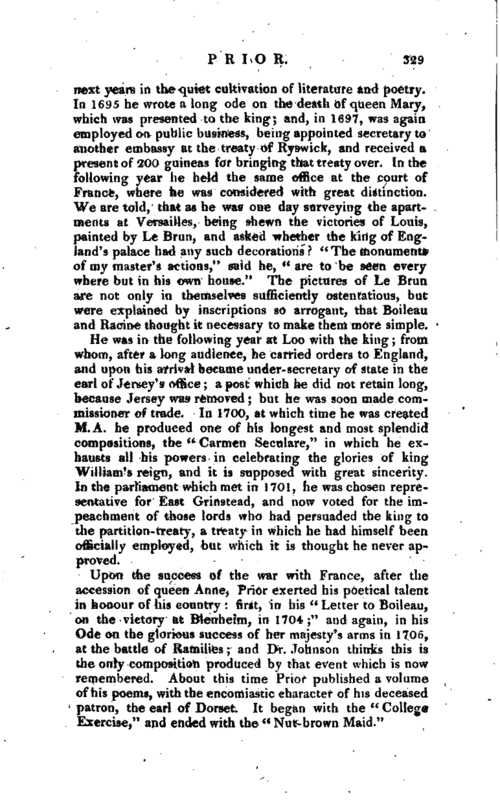 Upon the success of the war with France, after the accession of queen Anne, Prior exerted his poetical talent in honour of his country first, in his “Letter to Boileau, on the victory at Blenheim, in 1704;” and again, in his Ode on the glorious success of her majesty’s arms in 1706, at the battle of Ramilies and Dr. Johnson thinrks this is the only composition produced by that event which is now remembered. About this time Prior published a volume of his poems, with the encomiastic character of his deceased patron, the earl of Dorset. It began with the “College Exercise,” and ended with the “Nut-brown Maid.” | Prior now, whatever were his reasons, began to join the party who were for bringing the war to a conclusion, who were to expatiate on past abuses, the waste of, public money, the unreasonable “Conduct of the Allies,” the avarice of generals, and other topics, which might render the war and the conductors of it unpopular. Among other writings, the “Examiner” was published by the wits of this party, particularly Swift. 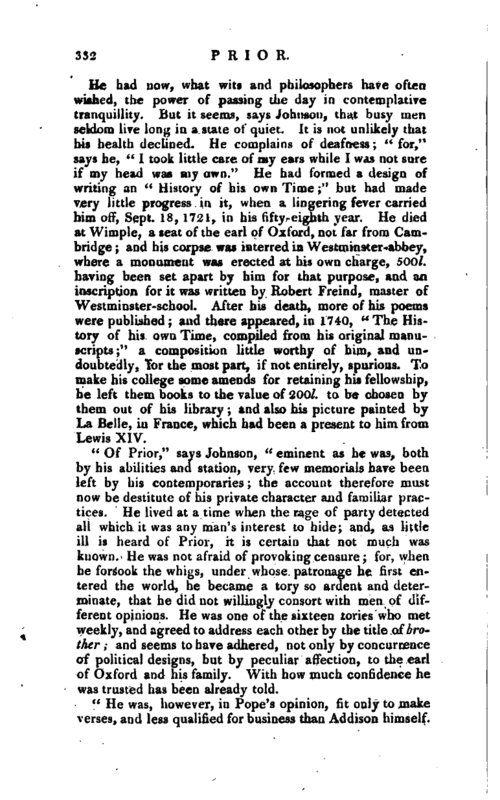 One paper, in ridicule of* Garth’s verses to Godolphin upon the loss of his place, was written by Prior, and answered by Addison, who appears to have known the author either by conjecture or intelligence. The conferences began at Utrecht Jan. 1, 1711-12, but advanced so slowly, that Bolingbroke was sent to Paris to adjust differences with less formality and Prior, who had accompanied him, had, after his departure, the appointment and authority of an ambassador, though no public character. Soon after, the duke of Shrewsbury went on a formal embassy to Paris, but refused to be associated with a man so meanly born as Prior, who therefore "continued to act without a title till the duke returned next year to | England, and then he assumed the style and dignity of ambassador. 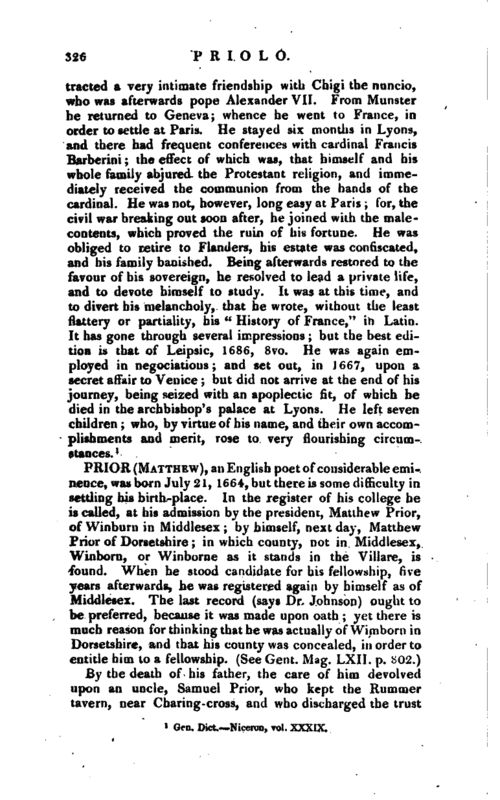 Yet even while he continued in appearance a private man, he was treated with confidence by Lewis, who sent him with a letter to the queen, written in favour of the elector of Bavaria, and by M. de Torcy. His public dignity and splendour commenced in August 1713, and continued till the August following; but it was attended with some perplexities and mortifications. He had not all that is customarily given to ambassadors he hints to the queen, in an imperfect poem, that he had no service of plate; and it appeared, bv the debts which he contracted, that his remittances were not punctually made. He had now his liberty, but had nothing else. Whatever the profit of his employments might have been, he had always spent it; and at the age of fifty-three was, with all his abilities, in danger of penury, having yet no solid revenue but from the fellowship of his college, which, when in his exaltation he was censured for retaining it, he said “he could live upon it at last.” Being, however, generally known and esteemed, he was encouraged to add other poems to those which he had printed, and to publish them by subscription. The expedient succeeded by the industry of many friends, who circulated the proposals, and the care of some, who, it is said, withheld the money from him lest he should squander it. The price of the volume was two guineas the whole collection was four thousand to which lord Harley, the son of the earl of Oxford, to whom he had invariably adhered, added an equal sum, for the purchase of Down-hall, which Prior was to enjoy during life, and Harley after his decease. | He had now, what wits and philosophers have often wished, the power of passing the day in contemplative tranquillity. But it seems, says Johnson, that busy men seldom live long in a state of quiet. It is not unlikely that his health declined. He complains of deafness “for,” says he, “I took little care of my ears while I was not sure if my head was my own.” He had formed a design of writing an “History of his own Time;” but had made very little progress in it, when a lingering fever carried him off, Sept. 18, 1721, in his fifty-eighth year. He died at Wimple, a seat of the earl of Oxford, not far from Cambridge and his corpse was interred in Westminster-abbey, where a monument was erected at his own charge, 500l. having been set apart by him for that purpose, and an inscription for it was written by Robert Freind, master of Westminster-school. After his death, more of his poems were published; and there appeared, in 1740, “The History of his own Time, compiled from his original manuscripts;” a composition little worthy of him, and undoubtedly, for the most part, if not entirely, spurious. To make his college some amends for retaining his fellowship, he left them books to the value of 2001. to be chosen by them out of his library and also his picture painted by La Belle, in France, which had been a present to him from Lewis XIV. “Of Prior,” says Johnson, " eminent as he was, both by his abilities and station, very few memorials have been left by his contemporaries; the account therefore must now be destitute of his private character and familiar practices. He lived at a time when the rage of party detected all which it was any man’s interest to hide; and, as little ill is heard of Prior, it is certain that not much was known. He was not afraid of provoking censure; for, when he forsook the whigs, under whose patronage he first entered the world, he became a tory so ardent and determinate, that he did not willingly consort with m’en of different opinions. He was one of the sixteen tories who met weekly, and agreed to address each other by the title of brother; and seems to have adhered, not only by concurrence of political designs, but by peculiar affection, to the earl of Oxford and his family. With how much confidence he was trusted has been already told. "He was, however, in Pope’s opinion, fit only to make verses, and less qualified for business than Addison | himselfThis was surely said without consideration. Addison, exalted to a high place, was forced into degradation by a sense of his own incapacity; Prior, who was employed by men very capable of estimating his value, having been secretary to one embassy, had, when great abilities were again wanted, the same office another time; and was, after so much experience of his knowledge and dexterity, at last sent to transact a negociation in the highest degree arduous and important, for which he was qualified, among other requisites, in the opinion of Bolingbroke, by his influence upon the French minister, and by skill in questions of commerce above other men. “Of his behaviour in the lighter parts of life, it is too late to get much intelligence., One of his answers to a boastful Frenchman has been related and to an impertinent one he made another equally proper. During his embassy he sat at the opera by a man, who, in his rapture, accompanied with his own voice the principal singer. 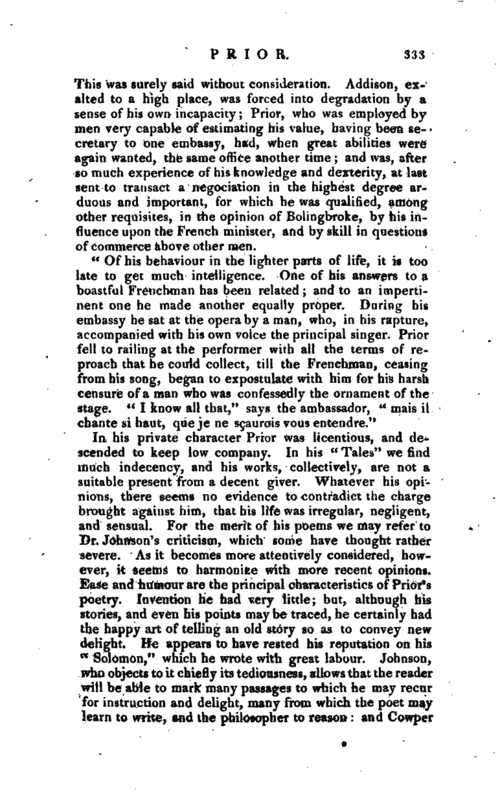 Prior fell to railing at the performer with all the terms of reproach that he could collect, till the Frenchman, ceasing from his song, began to expostulate with him for his harsh censure of a man who was confessedly the ornament of the stage.” I know all that,“says the ambassador,” mais il chante si haut, que je ne sgaurois vous entendre." Johnson’s Lives. Biog. Brit. Gibber’s Lives. Swift’s Works, see Index. Burners Own Times. 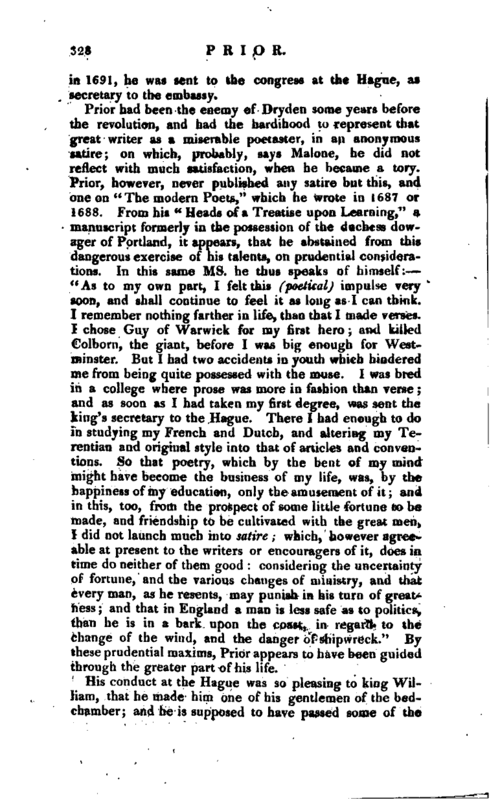 Hayley’s Lift of Cowper, vol. I. p. 290. Nichols’s Poems. Fitzosborne’s Letters, Letter LXXI 11. Bowles’s Pope. Malone’s Dryden, vol. I. p. 54 12. Forbes’s Life of Beattie. —Boswell’s Life of Johnson. Nichols’s Correspondence of Atterbury. Spence’s Anecdotes, ms. —Gent. Mag. Index, and vol. LVII. 137,399; LIX. 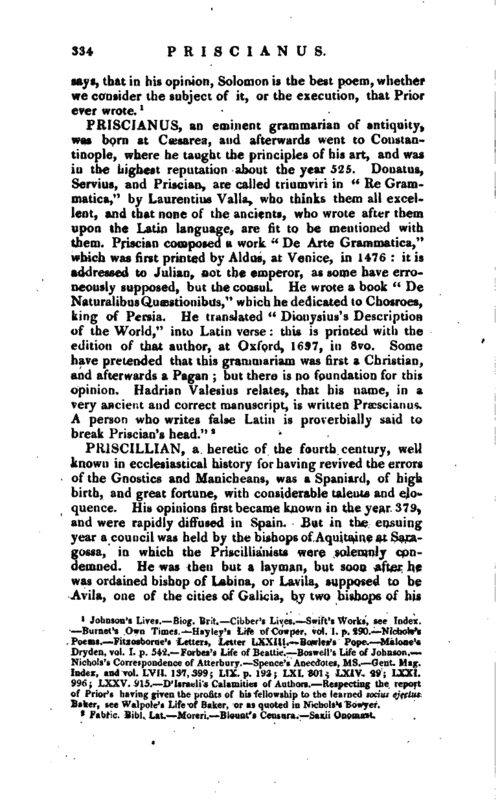 p. 193; LXI. 801 LXIV. 29; LXXI. 996; LXXV. 915. D’Isratli’s Calamities of Authors. 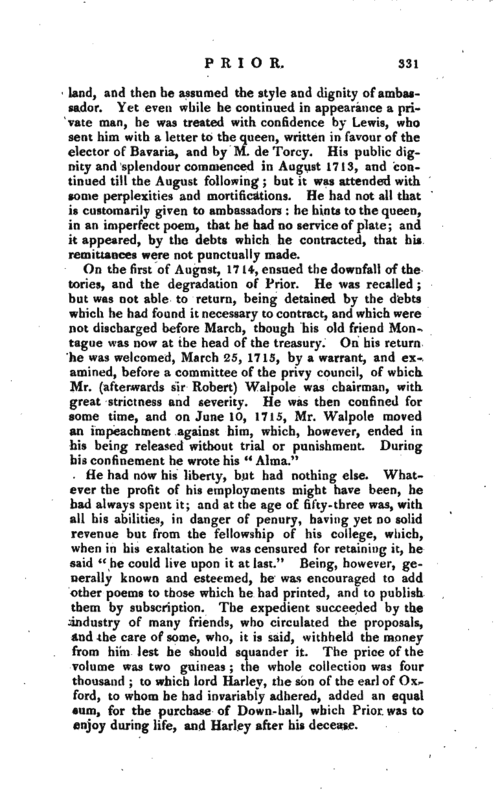 Respecting the report, of Prior’s having given the profits of his fellowship to the learned socius ej Baker, see Walpole’s Life of Baker, or as quoted in Nichols’s Bowyer.